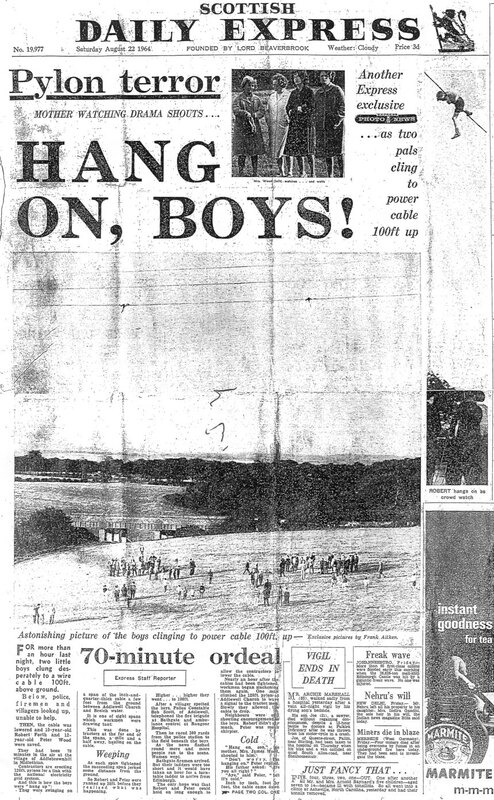 Amazing pictures on the front of the Daily Express, 22 August 1964. Daily Express. All rights reserved. West Calder hit the headlines of the national press when a picture taken by Mr Frank Aitken, of Bathgate, was published in a well-known daily paper. One could scarcely believe what they saw, for the picture showed two young boys clinging to a power cable 100 feet up in the air. Firemen from Bathgate and policemen were quickly on the scene, but everyone stood helpless watching the plight of the two lads. The boys were on the cable for 70 minutes, clinging desperately all the time. Contractors who were erecting the 120ft pylons for a link with the National Grid were unaware of the boys’ plight. The two boys, from the Addiebrownhill area at Addiewell, had been swinging on the cable which was nearly at ground level, when suddenly the cable was drawn tight by tractors a mile and a half away. The boys were lifted into the air at 30ft, before they realised what was happening. It was a case of holding on as they went higher and higher into the air. Nearly an hour after, the workmen began to slacken the cables and slowly the boys were lowered to the ground. Eager hands grasped the boys. The two boys who hit the headlines with their unusual and unforgettable experience are 10-year-old Robert Forth and 12-year-old Peter Wood. Their 13-year-old friend Billy Gillies played a big part in their timely rescue, for it was he who dashed to warn the police of the plight of the two boys who were high on the wire. However, all’s well that ends well. The boys, although shocked at first, are now back at school and we are told none the worse from their ordeal. However, we are sure that they will tell their story often in the years to come. It was an unforgettable day – and if anyone should ever doubt them, they have the picture to prove it. I remember your poor mother nearly passing out in her front garden. My brother,Peter Wood was one of the boys on the wire. We lived in Meadowhead Place at the time and my mother and some friends were on the bus to Bathgate when they saw the boys up above them. Peter, funnily enough went to work for the Scottish Electricity Board at one time and worked on the Pylons.